There are nearly half a million multifamily units in Chicago. More than 250,000 units are in census tracts marked as low and moderate income by the New Markets Tax Credit Program database. 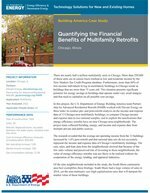 Furthermore, more than 60% of low-income individuals living in multifamily buildings in Chicago reside in buildings that are more than 75 years old. This situation presents significant potential for energy savings in buildings that operate under very small margins and that need to capitalize on all possible cost savings.